The Dual Lens Method: A Practical Approach to Information Systems Strategy in SMEs. This chapter describes the development and testing of a method for information systems (IS) strategy formulation in small and medium enterprises (SMEs). A case study describing a practical experience with the method is presented. Essentially the method is comprised of two complementary analyses: an externally focused strategic analysis and an internally focused business process analysis. The method draws on the work of Levy and Powell (1999, 2000). The method is simple and clearly prescribed and does not require, as does the approach of Levy and Powell (1999, 2000, 2005), the selection of approaches from a range of applicable techniques. However, before assessing IS strategy formulation approaches for SMEs, including the work of Levy and Powell (1999, 2000, 2005) the authors will seek to justify the need for an IS Strategy Formulation Method for SMEs and then reflect on the importance of relevance and practicality, as two features of the approach which are important considerations in terms of establishing the method in practice. This section will justify the need for an IS strategy formulation method for SMEs and then reflect on the importance of relevance and practicality, as two features of the approach which are important considerations in terms of establishing the method in practice. A failure by SMEs, or any organisation, to effectively plan IS strategy that is well aligned with the organisation’s strategic business goals can result in serious financial consequences resulting from poor ICT investment decisions. Recent research indicates that SMEs that manage their ICT strategically and in alignment with their business strategy enjoy financial benefits (Wynn, 2009). Whilst a formalised process for developing an information systems (IS) strategy is commonplace in many large organizations, the same cannot be said of IS strategy formulation in small and medium-sized enterprises (SMEs). In SMEs, reflective and considered enterprise-wide planning of IS investments is frequently lacking (Blili & Raymond, 1993; Levy & Powell 2000). The result of this can be disjointed IS portfolios that are not well aligned or integrated with the organisation’s strategic goals (Ward & Peppard, 2002; Levy & Powell, 2005). Past studies have suggested that the problem is that management in these businesses generally do not understand the role, nature and importance of effective decisions regarding IS investments (Levy & Powell, 2000; Hagmann & McCahon, 1993). Further, an effective yet simple IS strategy formulation method specifically taking account of the specificity of the SME business environment has not yet been developed, published and publicized (Levy & Powell, 2000). What is required, therefore, is a theoretical framework and practical tools that are more simple and straightforward than those used in large companies (Blili & Raymond, 1993; Levy & Powell, 2000). 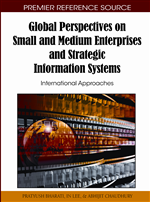 In an attempt to address the disproportionate focus of the information systems strategy literature in the past on large organisations, this paper describes a theoretically-informed method, specifically designed to guide small to medium business enterprises (SMEs) in developing an information systems strategy, by taking into account the special characteristics of SMEs. It is important to note in passing that the information systems strategy formulation method presented in this paper focuses on the determination of the strategic information systems capabilities that are needed in an organisation, and not on simple IT-based utilities such as e-mail and Microsoft Office-type capabilities. Such utilities and office support are considered necessities in today's business world and below the focus of an enterprise-wide strategic information systems plan. However, if desired, such considerations could easily be included in the Information Systems strategy formulation method.